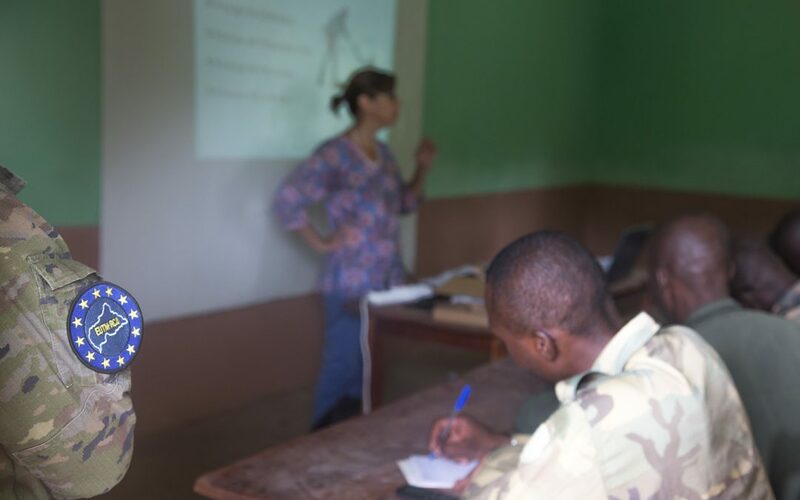 Beyond peace started today its training on IHL and prevention of sexual violence for the Central African armed forces (FACA) on behalf of EUTM, the EU training mission in CAR. Over 30 Officers from BIT 1 received a first instruction, as well as 41 NCOs from other units. Based in Bangui and deployed upon the request of the Transition President, the EUTM RCA is contributing to rebuilding a modernised, effective, inclusive and democratically accountable Central African Armed Forces (FACA). It provides strategic advice to the Central African Republic’s Ministry of Defence and the general staff, as well as education to officers and non-commissioned officers, and training to the FACA. Beyond peace established a partnership with the mission, with the approval of the EU External Action service and with the support of UK Government. The objective is to integrate the training component on behaviour into all training delivered by the EUTM for the FACA over a 6-month pilot period. Our Director Cynthia Petrigh arrived in Bangui on 7 July 2017 to design and develop the programme; she will be joined by other experienced trainers.